hoopla Visits The City by the Bay for ALA 2015! 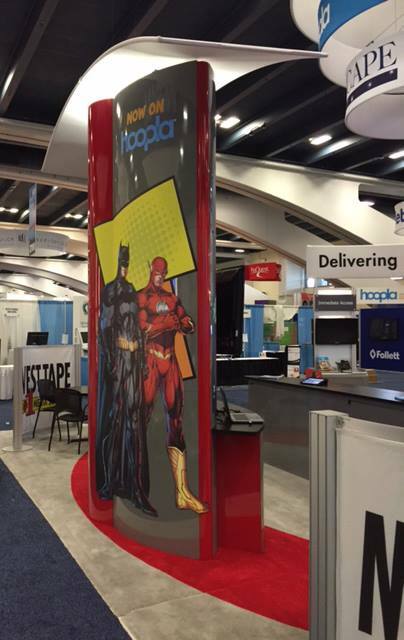 After all the excitement in San Francisco at the ALA Annual Conference, hoopla partner libraries are buzzing after the announcement of DC Comics arriving on hoopla. This year’s conference theme was the continuing transformations of libraries, and hoopla/Midwest Tape is proud to play a part in that transformation. The Midwest Tape sales team was also present at the show, and were thrilled to show off our booth featuring some of the biggest names in DC Comics; Batman, Superman, Wonder Woman and Green Arrow. Our team relishes the opportunity to connect with librarians, as they are at the heart of hoopla’s success at their library. At the booth, selfies were snapped, meetings were held, and the hoopla eBooks/comics discussion continued throughout the conference. If you missed out on the ALA action, our Facebook and Twitter (@hoopladigital) accounts continue to be the best place to check out our hoopla team at events across the US and Canada. Check out Drexel University and Free Library of Philadelphia's new innovative lending program. hoopla digital is one of 5 apps available to all iPad borrowers! Check out Drexel University and Free Library of Philadelphia's new innovative lending program. hoopla digital is one of 5 apps available. hoopla digital is proud to both attend and be a sponsor at this year's Library Journal Directors' Summit in Chattanooga, Tennessee. Among the speakers are representatives from two hoopla partner libraries. Library Journal 2014 Librarian of the Year Corinne Hill, Executive Director at Chattanooga Public Library. Also represented is Library Journal's Library of the Year for 2014, Edmonton Public Library. EPL Deputy CEO Pilar Martinez is also on hand to discuss the continued evolution of the library and how it fits into the community of the future. If you are attending the summit, be sure to connect social media using the hashtag #LJSummit14.